A lack of energy is something that a lot of people struggle with nowadays, due to busy lives, not enough sleep and other lifestyle factors. We often get customers coming into our store asking for advice on how to boost their energy levels naturally. Sometimes there is an obvious reason why a person is feeling fatigued – for example they may have recently had an illness that has left them drained, or they are going through a period of stress in their life – but sometimes it can be difficult to pinpoint the reason why. This is why we take a holistic approach, asking the customer all about their lifestyle, their diet, the amount of exercise they do, how much sleep they get and any medication they may be taking. In terms of natural remedies, the B vitamins help to support the nervous system and help to release energy from food, so we would recommend a good vitamin B complex to someone who was suffering with fatigue. Magnesium is another useful remedy which can help with stress-related fatigue as it is a natural relaxant. Iron is important too, but if a person was concerned that they were deficient in iron then we would recommend that they visit their GP to get checked out. Chromium is an increasingly popular supplement as it helps to balance the body’s blood sugar levels. When blood sugar levels are unbalanced this can lead to surges of energy followed by crashes into fatigue. We know that many people are lacking in nutrients like selenium and magnesium because they’re not as prevalent in the soil. Therefore it’s always a good idea to take a good quality multivitamin to ensure that you are getting all the essential nutrients. In addition to vitamins and minerals, there are a number of herbal remedies and supplements that can also help with a lack of energy. Ginseng and ginkgo biloba are known to help improve the circulation, which can combat fatigue and co-enzyme Q10 generates energy within cells. I think one of the biggest problems we face in this country is too much sedentary behaviour, which is why we always recommend regular exercise to our customers. It may seem counterintuitive, but if you are feeling fatigued, exercise can actually help to boost your energy by improving the circulation. Physical activity can improve all aspects of our wellbeing from our mental health to our cardiovascular system and gastrointestinal health. We would also encourage our customers to look at their diets and either cut out or reduce things like refined sugar, alcohol, caffeine and processed foods as these can all contribute to feelings of fatigue. We would always recommend a balanced diet containing plenty of fruit, vegetables, wholegrains, healthy fats, lean protein and slow release carbohydrates, which help to keep the blood sugar levels balanced. There are plenty of natural ways to give yourself a pick-me-up, and your local independent healthcare store is a great place to find advice and help. 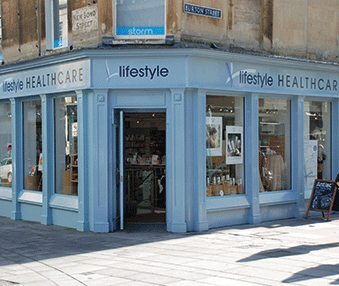 Lifestyle Healthcare is based at 14 New Bond Street, Bath, BA1 1BE. The store has been established for around 20 years and was originally a pharmacy, which now also focuses on complementary medicine. The store stocks a wide range of vitamins, minerals and supplements as well as herbal medicines, skincare and natural and organic bodycare products. All staff members are trained in health and wellbeing and are on hand to offer help and advice to customers.